On Sunday I was lucky enough to get a spot with the Boston Brunchers for an afternoon at Chestnut Hill Square. I was so glad I went since I haven’t really been over there since it was all re-done. 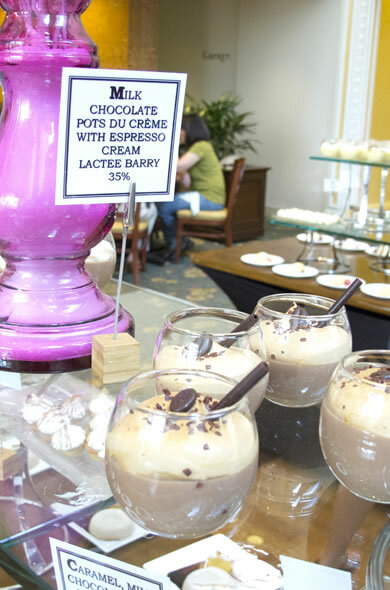 I was glad to meet a few new bloggers and this event was fun because we mixed a few categories of foodies, athletes, etc. 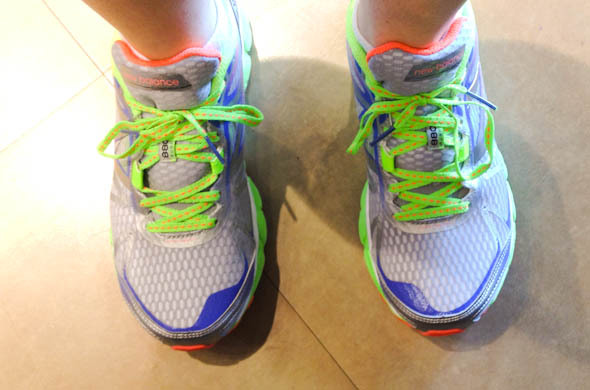 We started at True Runner and got to test out some New Balance sneaks for our hike and some techy tom toms. I declined the Tom Tom and stuck with my fitbit. I did take advantage of borrowing the sneakers. They were great, though I don’t know how much I’d have to love them to dish out $115 for them, since a) I’m not a runner and b) I’m 4.5 months pregnant so starting to run isn’t in my near future. How fun are those laces though?! We walked a leisurely pace. I clarified that we weren’t running but I hope the pace wasn’t meant for me. I could have gone faster but it was beautiful out and the homes in those neighborhoods are so amazing. 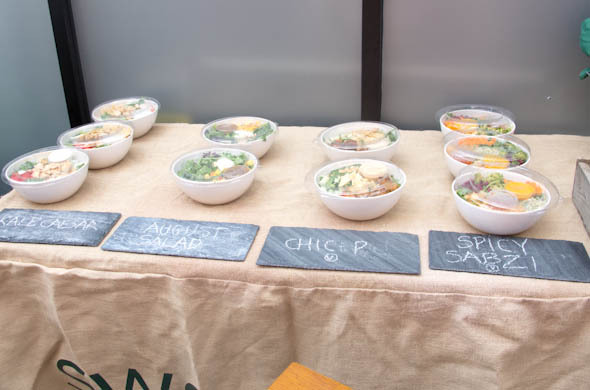 Then we returned and promptly went to Sweetgreen. They were very hospitable with blueberry basil lemonade ready at our reserved tables. I love that they focus on local foods, and that they compost everything. My only thought was that we were crammed into the patio. They made a bunch of salads for us to pick from but some of us were boxed in and got stuck with 2 remaining choices nobody really wanted. I think their menu looks fantastic and I’ll definitely be back…that being said, I wasn’t into my salad. I just can’t give a steller review for a salad I would never have chosen. I had the Spicy Sabzi. 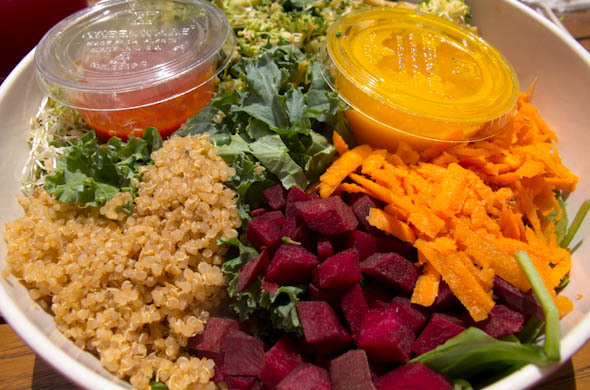 It was spinach and kale, with spicy quinoa, spicy broccoli, raw beets, carrots, sprouts, and tofu. Had I known what was really in it, I would have passed. It was just too spicy for me. Plus, I don’t like raw beets, and sprouts are a no-go during pregnancy annnnd certain squishy foods aren’t appealing to me these past 4 pregnant months. They were super smart to have stuff ready, but I wish I got to order. I’m glad we weren’t disrupting their usual customers though. The dressing was a chili vinaigrette and I skipped the sriracha. I ate some of it. It was just too spicy. A few salads were gone in a second ahmm:kale caesar, cough: chic p. I will go back because I like the prices, local ingredients, attention to detail, and the vibe. The santorini salad with feta, shrimp and cucumber basil yogurt dressing sounds amazing and the guacamole greens has my name written all over it. 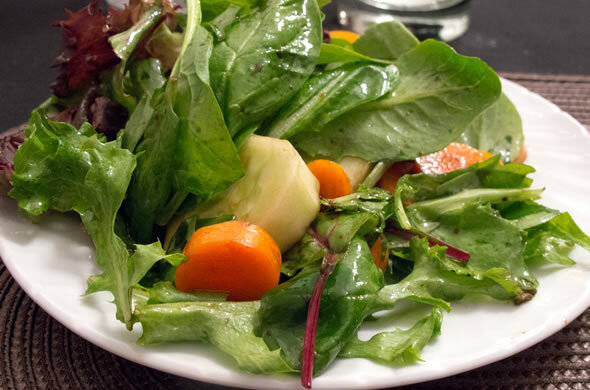 Who knew I’d be so picky for salad? 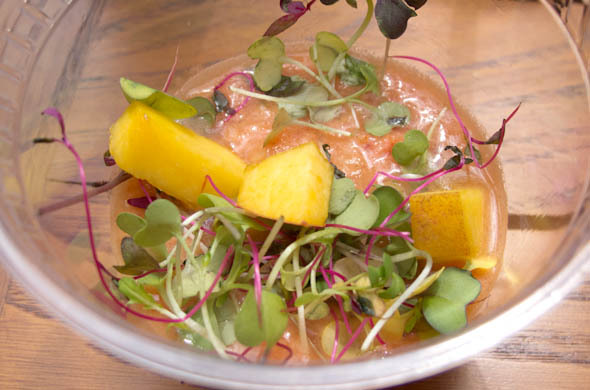 They gave us a taste of the seasonal gazpacho which was tomato peach. I loooved it. 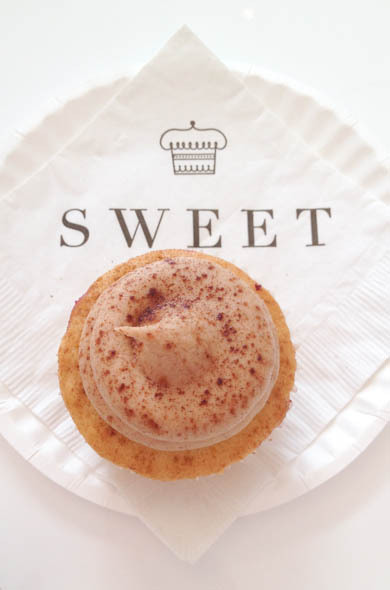 Next up was Sweet Cupcakes to round out our day. 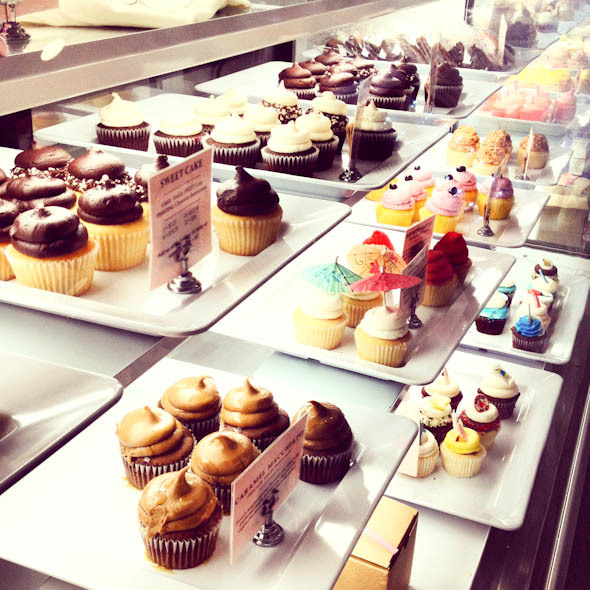 I love Sweet and went to the downtown crossing location a few times. They’re just so clever to have shots of frosting. Those came in handy when work was just too much. The cupcakes are better than most others around. The shop and manager were just too cute. She told us about the seasonal flavors and how often they rotate. We had a few to try and then chose a few others to taste. We tried a Honey Blackberry cupcake which was the best dessert I’ve eaten in a months. The frosting was cinnamon-y and I loved it. I’d normally go towards peanut butter, chocolate, or coconut. This made me change my tune. There are 6 Sweet locations and I’m glad they’re doing so well. They’ve opened one a year! 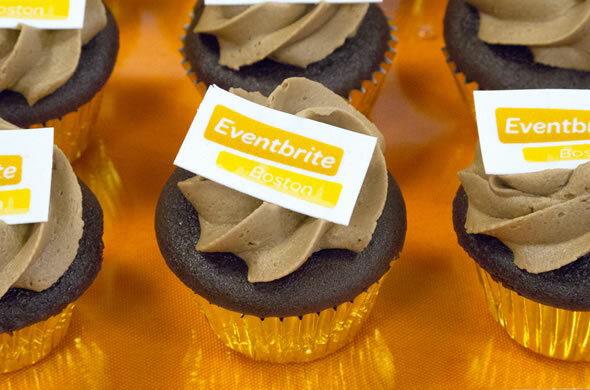 Two other cupcake Boston area joints have closed. The Somerville one shall remain nameless, but I’m not surprised. As an event planner I’m so impressed how well organized the whole day was. Three venues and a group of more than 10 can definitely alter ideal timing but they had everything coordinated perfectly. We got some goodies from a few more of the stores and we had a delightful day. Full 3 Bite Rule Disclosure: My invitation seat with the Boston Brunchers was completely complimentary but my thoughts, opinions, and words are entirely my own. I did it. 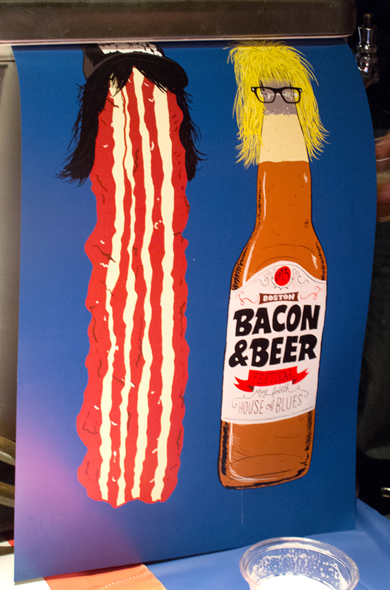 I went to Bacon & Beer Fest. Finally! The tickets sell out in the first 10-minutes online. Luckily, Ms. L was on it and grabbed a few. It benefits Community Servings and Lovin’ Spoonfuls. I love those two groups but was disappointed that there was zero representation of the organizations. The event was great, though now it is a bit outdated. Better late than never. The lighting and crowds didn’t make it an ideal photo-op, but I had to snap a few while juggling my beer cup and spork. Check out the crowds. 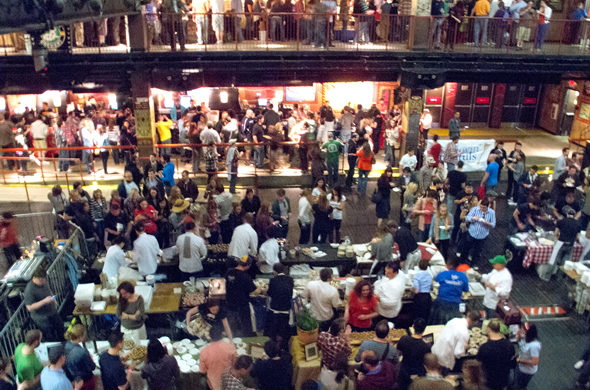 There were restaurants on the floor and breweries and more restaurants around the edges on 2 levels. This was huge and not our favorite, but I really liked the idea. 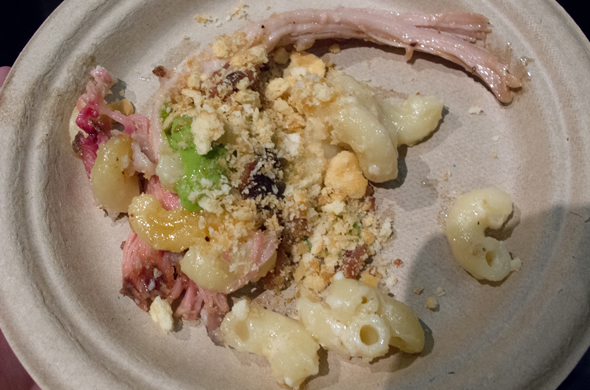 This mac & cheese had smoked pork and avocado cream. This was my favorite sweet bite of the day. 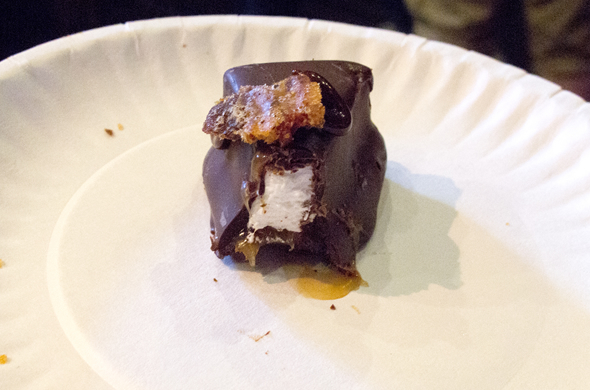 It was a take on a smore from Petit Robert. 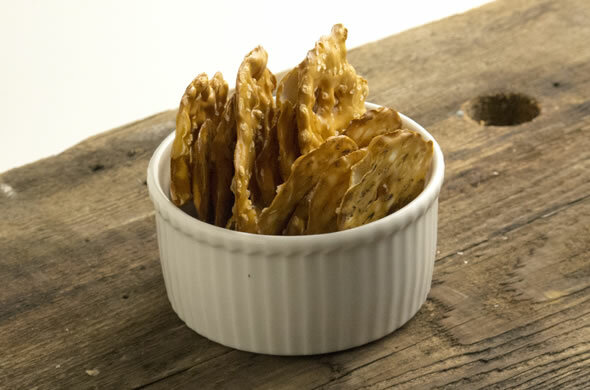 Once upon a time, food bloggers in Boston and Austin TX decided to swap goodies. The first swap was in 2011 but I somehow I missed that one. When I saw it come along again I was all over it. Here’s the scoop, each blogger said they were interested and then were matched to an interested blogger in the other city. We exchanged a few emails about likes/dislikes and with a $30 limit we were off! I forgot to snap a photo of what I sent. 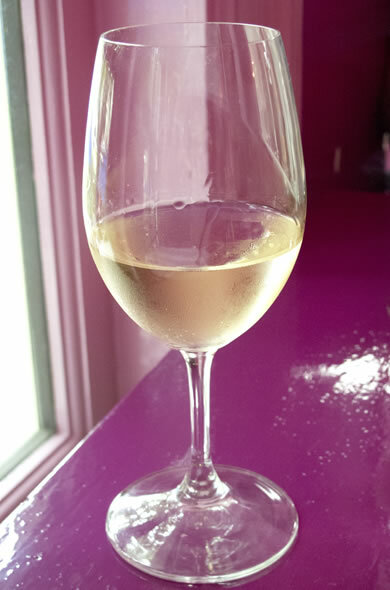 Luckily my swapping buddy is a more timely blogger than I, so enjoy her photos of what I sent (and her blog!) There was some pressure we both felt to share our region’s cuisine…well, that which was ship-able. 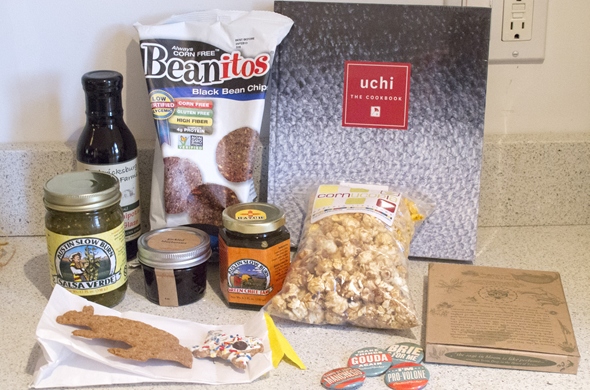 I got bean chips, popcorn, doggie treats for my pup, salsa, a marinade, pickled blueberries, cheese pins, stationary and a lovely cookbook. Yes. I got all that (and a bag of chips)! 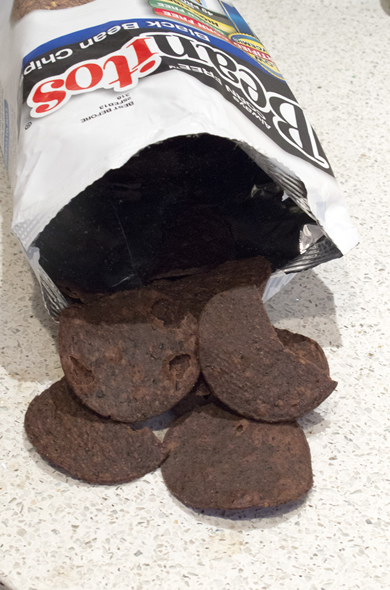 The chips are totally interesting. They were definitely tasty with salsa. I honestly had no idea why I wouldn’t want corn in my chips, but upon reading more, corns are linked to a few health issue, and beans provide lots of fiber, protein, omega 3s etc. I’m psyched to get something marinating in the new sauce and I’m totally intrigued by the pickled blueberries. I found the popcorn totally addicting. 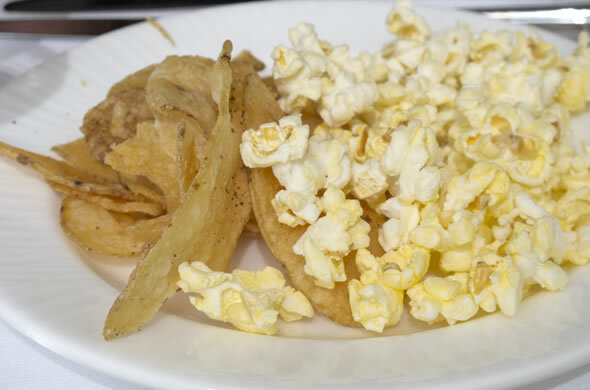 It has a serious kick and a lovely sweetness between the two popcorn flavors. I couldn’t stop myself. It is such a good combo. The pup LOVED his armadillo & Texas shaped treats! (He hasn’t mastered the treat-on-nose trick or I’d have snapped a pic. The cheese week buttons cracked me up. How clever are they?! She outdid herself. I was so impressed and thrilled to get such great swap items! 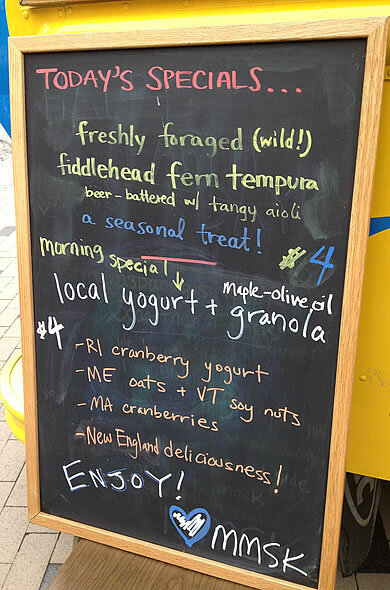 I went to a food truck event on the Greenway last May and thought it was the best food truck gathering I’d been to. This is one of my favorite spots in Boston and it was a beautiful fall day. Mrs. C was pumped to join Mr. J and me after we followed the Great Food Truck Race religiously. Luckily we went early! It got pretty crazy busy when we left later. 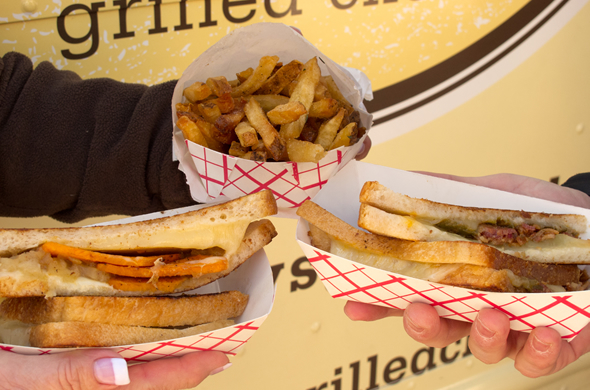 We shared a fall melt: sweet potato/grannysmith apple/cheddar/brown butter; a muenster melt: muenster cheese, quacamole, bacon; and some rosemary truffle fries. 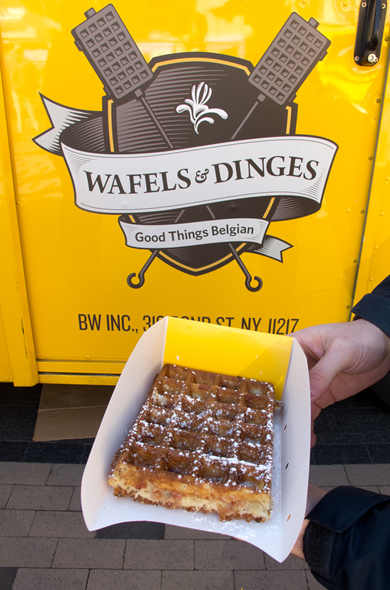 We also were pretty psyched about these waffles from Wafels & Dinges. Wow. I wish they were in Boston! Bacon in a waffle? Yes Please! It was great to split everything. 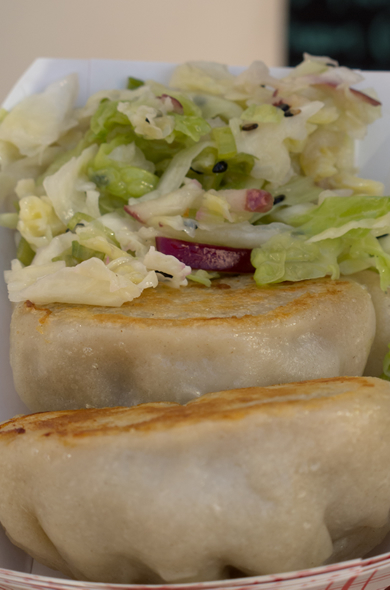 We each munched these pork and chive dumplings from Big D’s Grub Truck. They were awesome. I loved that we could get smaller bites. 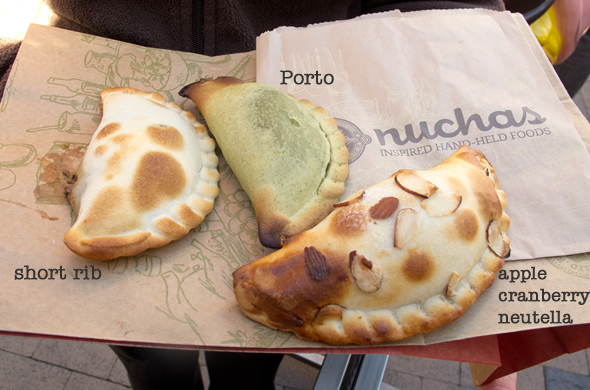 The empanadas at Nuchas was another one of my favorite stops. Mine was portobello/spinach/mozzarella and was awesome. 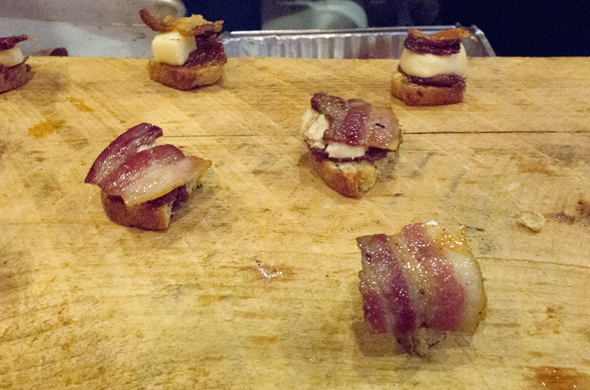 These were small and packed with flavor without being overwhelming. I was impressed with their truck (and their website). 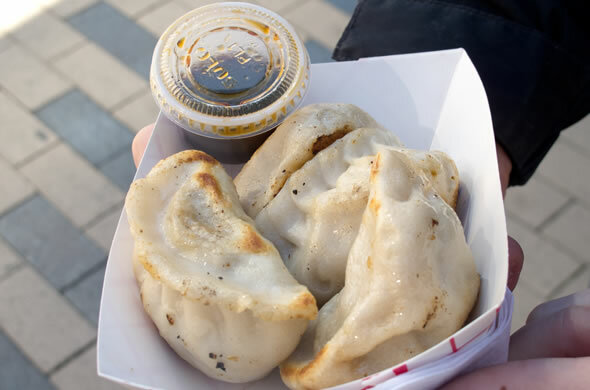 We ran into two Ms. Ls and Ms. J and they recommended another Boston truck: Mei Mei. 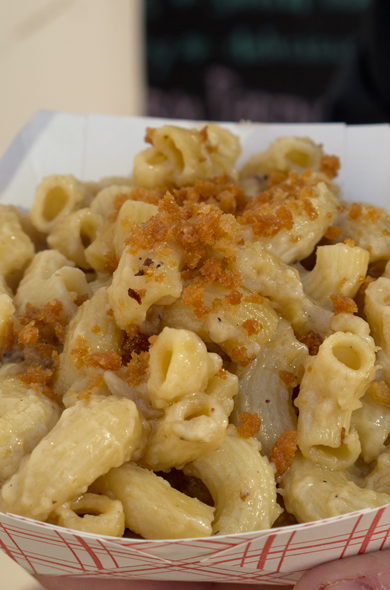 We got some beer mac & cheese which was fine, not overly cheesy. The beer flavor came through though. Mr. J got beef and bleu dumplings. He thought they were ok. The menu there is impressive. I love how focused they are on local foods. I got the ginger macaron and thought it was overpriced and kind of a letdown. I wish you could see how itty bitty it was. 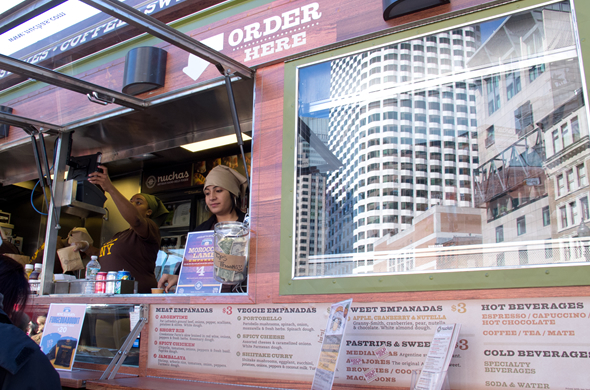 I didn’t stop by Bon Me, but will sometime since they’re often parked by my office. Obviously I skipped past Lobsta Love since I’ve had rough experiences with them in the past. We grapped some cookies to go and that wrapped up our day. Literally. We didn’t eat anything again for the rest of the day. It was delicious and Boston won!! Of course! I was invited to a pop up restaurant and just couldn’t pass on the opportunity. I hadn’t ever really heard of one up close and was psyched. It wasn’t what I expected but it was a great night. I had fun meeting some new folks and I was so glad Ms. M came with me. She’s such a good sport and we were both happy to be fed. I left to meet Ms. M with a warning from Mr. J not to enter if this was in some guy’s basement. I was thinking the whole time what happens when you mix Asian and Southern? General Tzo’s Chicken & Waffles? The pop up was held in an ice cream shoppe in my old ‘hood. The name of the hosting venue would have been helpful. We showed up for the third sitting and they were running late. We squeezed in and were served promptly. Introductions got us going at communal tables as we began munching. The first dish was watermelon with blue cheese. 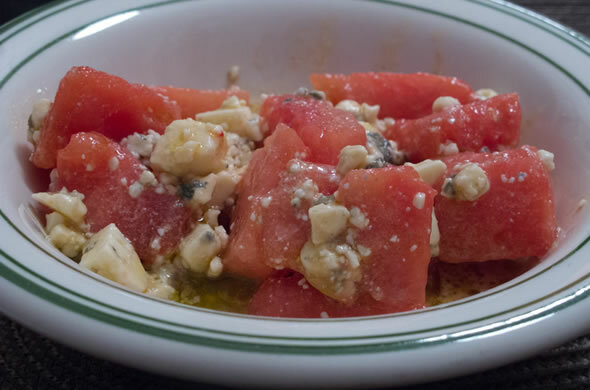 I was expecting feta and honestly thought the freshness of the watermelon didn’t pair well with the moldy cheese. We had a salad too. Next was a tomato bruschetta. 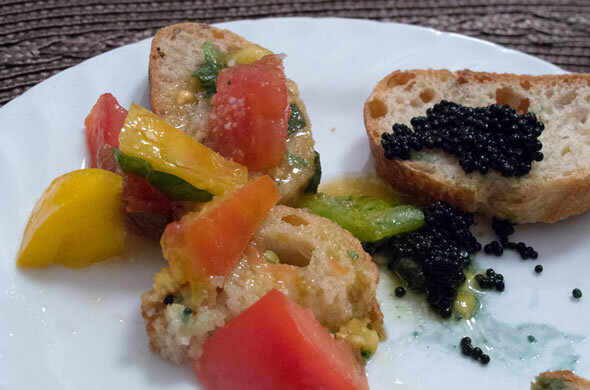 I loved the tomatoes but wasn’t into the caviar. 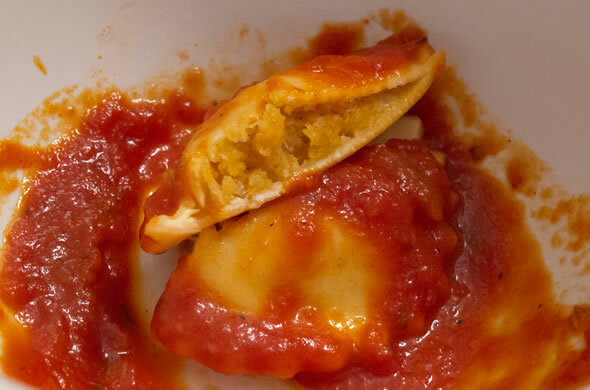 Our next dish was pumpkin ravioli with tomato sauce. Again, I think the flavors didn’t mix. I would have liked brown butter, or really good olive oil, or a light cream. The tomato sauce was super acidic to me. Then they served lasagna. I couldn’t eat it because it was beef. I was asked dietary restrictions before the meal (where I emailed) then I was asked again before we sat down. They were super sweet to offer me a sundae instead of the ice cream cup served afterwards, but I declined. It kind of annoyed me. Don’t ask if you’re not going to do anything. I felt like an imposition. I might have passed on the dinner if I knew what I’d be eating. 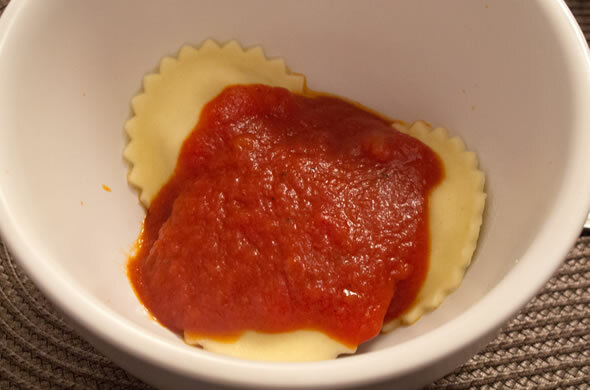 I would have been happy with a double serving of raviolis instead. 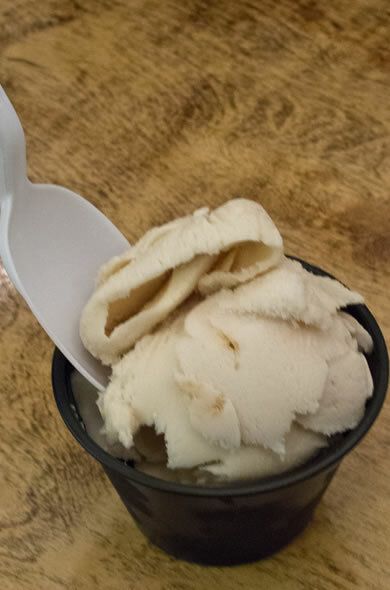 We got a cup of ice cream which was good, but the meal was so long that I had one foot out of the door. The food was fine and I’m sure some people enjoyed it more than me. I thought it should wow me. I thought I should be shouting from the rooftops. I thought this meal would rock my world and make me their unofficial spokesperson when a restaurant opened. I was underwhelmed. 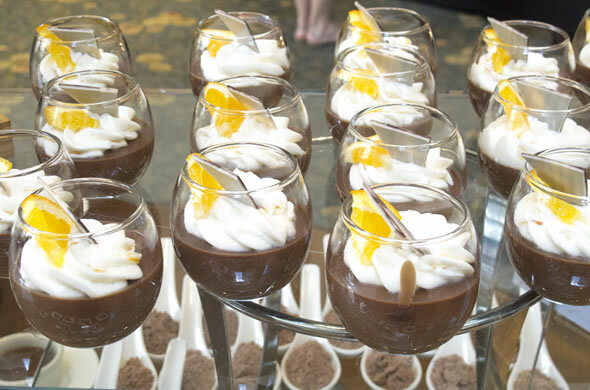 I wasn’t impressed with the how the event was run since I showed an email chain to get us in, they didn’t include the venue name, there wasn’t any explanation about what they were serving, and the dietary restrictions info wasn’t passed along. I also think they should have done 2 sittings if the food was going to be reheated and if they weren’t going to be able to accommodate the overlapping crowd three times that day. Did you notice this has absolutely nothing to reference Asian or Southern? Yeah, me too. Sometimes I’m brutally honest and I feel badly, but I owe you the good, the bad, and the ugly. This was a disappointing dinner. Maybe I was too hyped about it. It makes me glad we hadn’t bought a ticket to it. My invitation with a guest was complimentary but if I liked it I would have raved about it so it only seemed appropriate to be so harshly honest. Full 3 Bite Rule Disclosure: My invitation for myself and a guest was completely complimentary but my thoughts, opinions, and words are entirely my own. I have a lot of catching up to do. I just got back from a wonderful anniversary weekend away and I have quite the backlog of posts for you. Here’s one from a few weeks ago, but not to worry. You can still catch it. 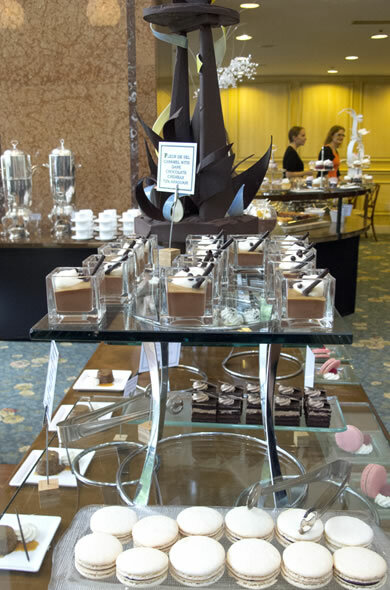 I was lucky to join Ms. L for the Langham Hotel‘s chocolate bar at Cafe Fleuri. It was delicious and I’ll let the pictures do most of the talking. There were so many amazing treats. Everything I had was great and I was sure to choose wisely since there was sooo much to chose from. 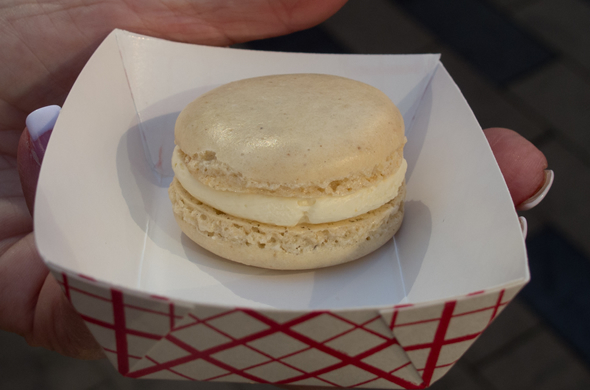 These macaroons were amazing…one of my favorite items of the day. This was hands down my favorite item. 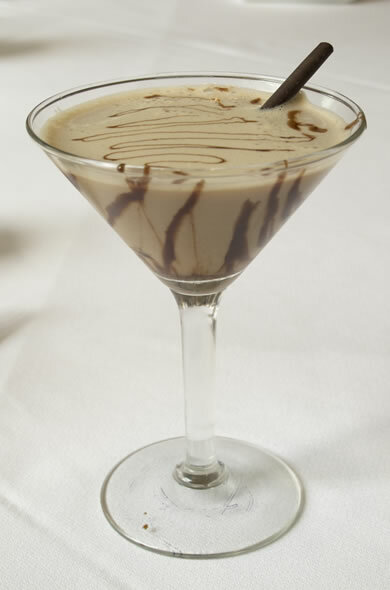 There was something about Peanut Butter Bomb in the name. 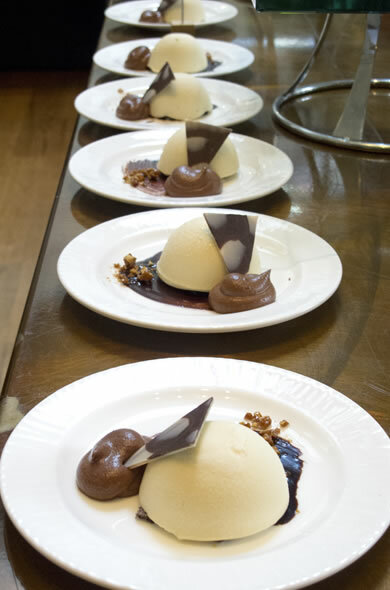 The tan part was soft peanut butter dough with a peanut butter center on some dark chocolate with a milk chocolate mousse. Thankfully they had some salty treats to keep us going. They make their own potato chips! I felt a bit wasteful since anything I deemed unworthy I didn’t go beyond the initial bite. There were too many good things to eat! We did a good job and left full without being sick, but it was overwhelming. I loved it for the price tag (free!) 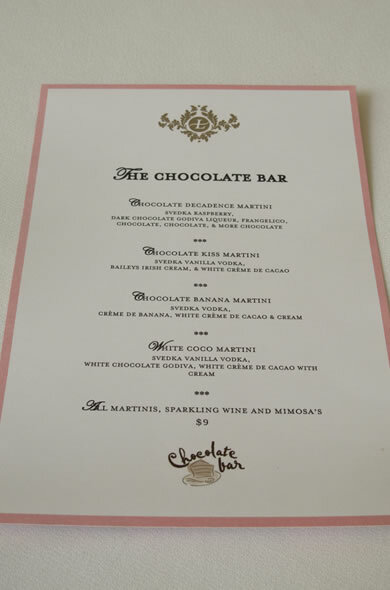 but I would be hesitant to pay $40 for one sitting of chocolate. 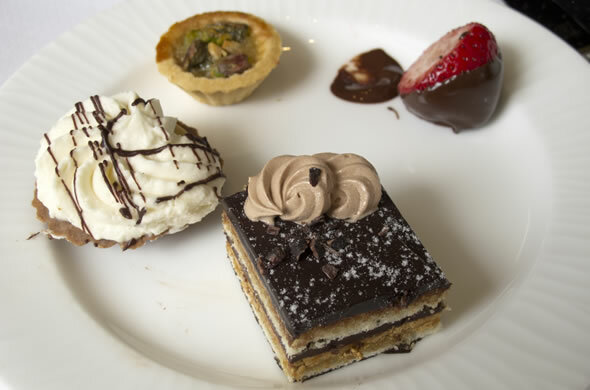 The desserts were really great, and there was an impressive spread of choices, but I’d only spend $40 on a box of chocolates I could enjoy until empty. I worked a gourmet candy store in high school and college so it isn’t lost on me, but free was fantastic. Full 3 Bite Rule Disclosure: Our invitation from Google+ Local to the chocolate bar was completely complimentary but my thoughts, opinions, and words are entirely my own. 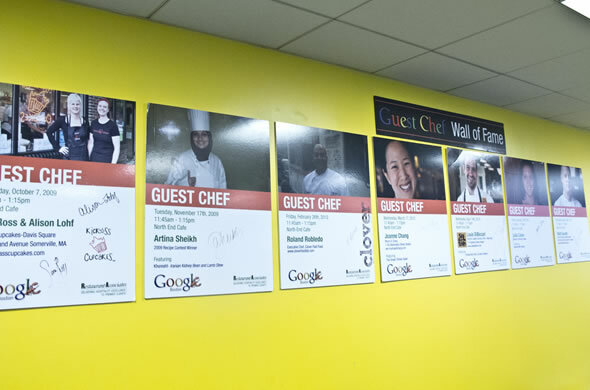 Google+ gave some spots away for a Lobster Walk n’ Roll event a few weeks ago in Harvard Square and I was lucky enough to get one. 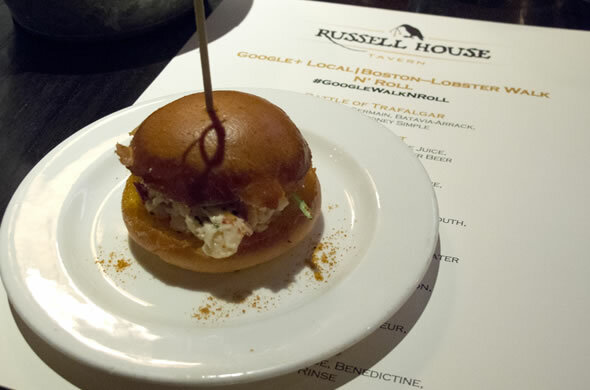 Liz from Eating Places joined me and we happily munched the lobster slider and cocktail tastes they offered up along with some photo tips while meeting other Google+ reviewers. 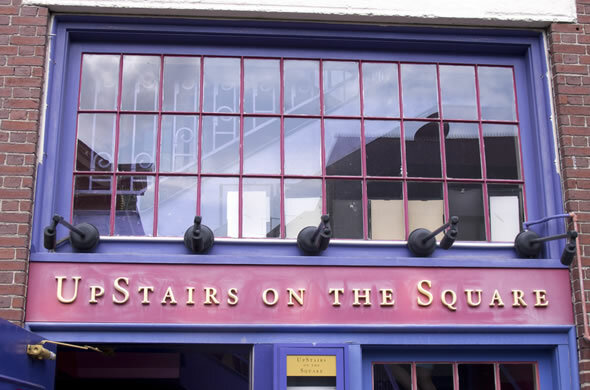 We began at Upstairs on the Square. I was psyched since I hadn’t been inside there. We were in a super cool pink zebra room. It was a bit pink for photos so bear with me. We got a small lobster roll and a glass of Sauvignon Blanc. This was a great way to start the afternoon. 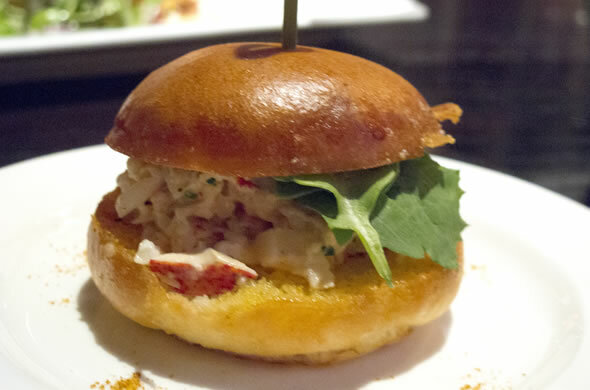 The lobster roll was really simple and filled a buttery roll. I was so happy to see the big chunks of lobster meat with very little dressing. 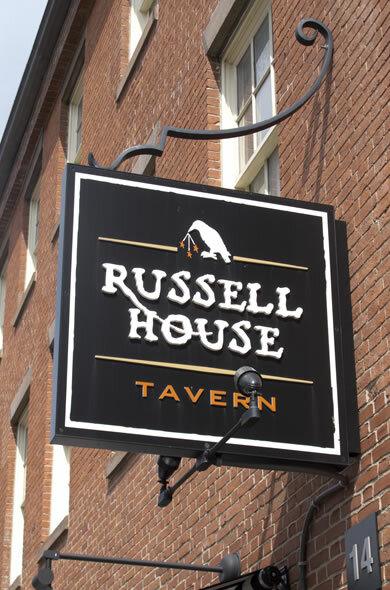 Next we made our way to Russell House Tavern for a slider and choice of cocktail. This slider reflected their mission to keep food from being pretentious. 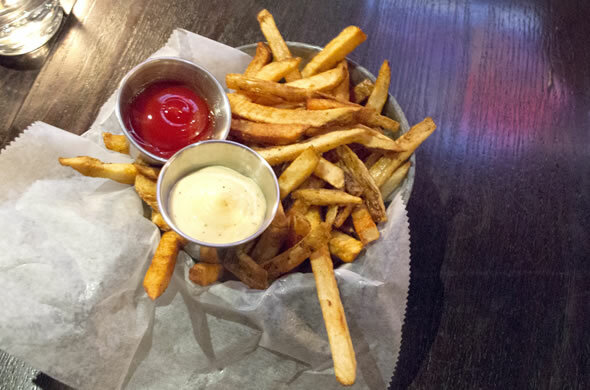 They kindly provided some fries as well, which were addicting to say the least. These sliders were my favorite of the day. I again LOVED that they were lightly dressed but had a touch of a kick. 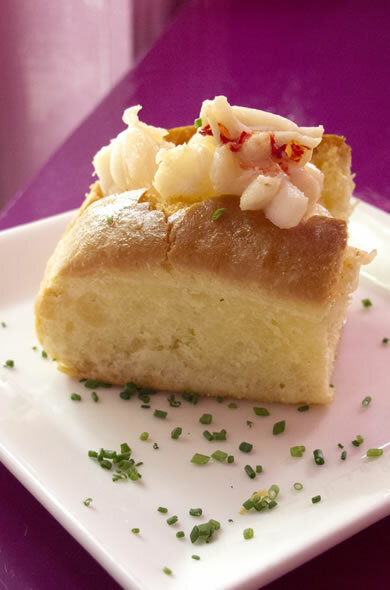 Gobs of mayo and miniscule chunks of lobster give lobster rolls a bad name…that isn’t how they’re supposed to be. 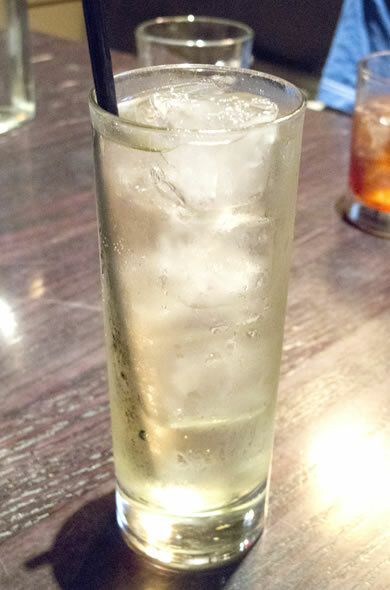 I got their house St. Germain cocktail with sparkling wine and soda water. 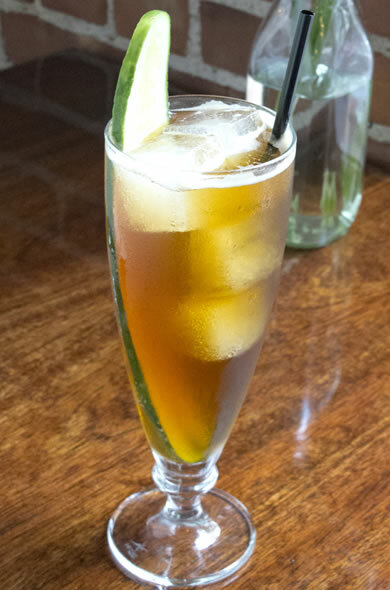 It was flowery and bubbly making it an ideal pairing with a very filled lobster slider. I’ve never been there for brunch but would love to. I need to get on that. Their breakfast sandwich is the stuff my dreams are made of. I might need accompaniment to get the bfast pizza or biscuits and gravy so I can try those too. I don’t know their restaurant Park , but I love Grafton Street. 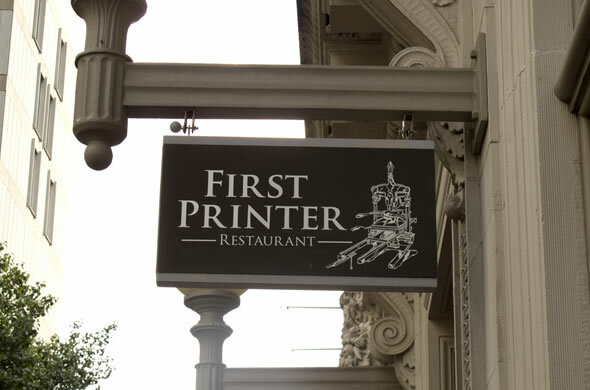 Next we made our way to The First Printer. I hadn’t been here before (I hear it had been Herrell’s Ice Cream). The interior is homey and charming. 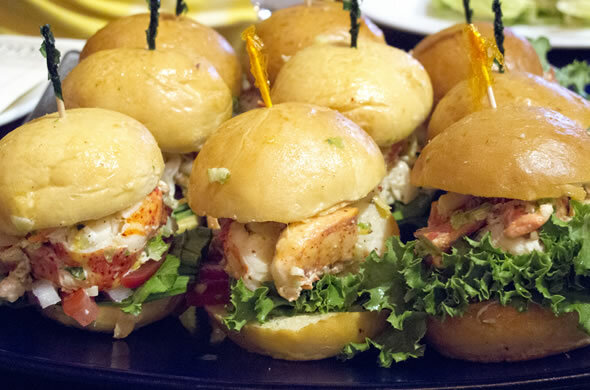 We cozied up in booths with platters of lobster rolls. They offered us 3 custom cocktails but everyone went with the same one! The crispy cuke stuck into it was show stopping. I have to say that their lobster rolls were my least favorite. The lobster meat was deliciously tender and I was pleasantly surprised by the orange zest. Their rolls were dry and stale. I think after having 2 other/different rolls these seemed lackluster. That didn’t stop me from eating the insides of other sliders though. Their ice cubes are crazy perfect squares. We were impressed and I mentioned it to the waitress who thought a) I was nuts, and b) that I was asking where ice comes from. It was awkward and couldn’t have been over fast enough. It was so nice of these restaurants to host us for this lovely summer Sunday funday. Full 3 Bite Rule Disclosure: The Lobster Walk n’ Roll was completely complementary but my thoughts, opinions, and words are entirely my own. It is almost too late to post this now that it is August, but hey, I make the rules so here you go! Ms. L and I went to a pizza rumble. SO good! 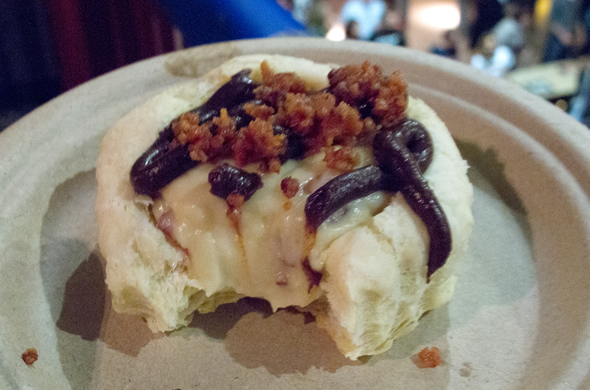 The rumble was a taste-off amongst 4 pizza places hosted by Parlor Sports. We paid for the tickets and then got to taste all 4 and vote for our favorite. There wasn’t any criteria but we heard from each pizza joint about what they were serving us. Emma’s Pizza in Kendall Square gave us what the kitchen staff most often make when they themselves are hungry. It had a paper thin crust topped with, in their words, “crispy smoked bacon/scallions/gorgonzola/house roasted tomatoes/garlic olive oil/light mozzarella”. Wow, right? Well, I was underwhelmed. The toppings weren’t evenly distributed. 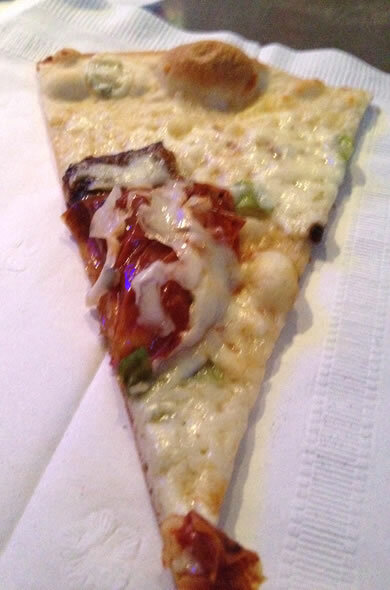 I was thankful that the toppings were sparse given that gorgonzola isn’t my fav. Eat at Jumbo’s cracked me up. I lived across the street for years and don’t remember eating their pizza. Mr. J thinks we didn’t love the pizza…who knows. Their pizza seems MIA from the menu but from what I remember, it was Jamaican Jerk chicken, roma tomatoes, bacon?, and banana peppers. This one was really good. It had the right amount of cheese and was so flavorful. Easy Pie served us Mac Daddy pizza. I could have this one because there was beef on it, but what a great idea?! Everyone loved this one! It was ground beef, special sauce, onions, pickles, and shredded lettuce. Spoiler alert: I recreated this one at home. Quite Tasty! 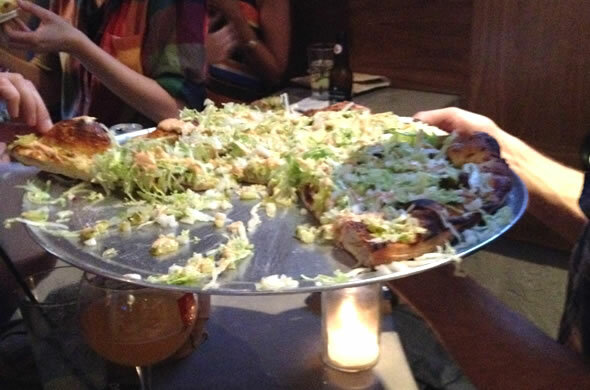 We rounded out our sampling was All Star Pizza Bar. I was psyched to see them there since I hadn’t made it to the famous sandwich bar’s latest pizza shop. They gave us a dessert one which was welcomed after our savory pizzas. 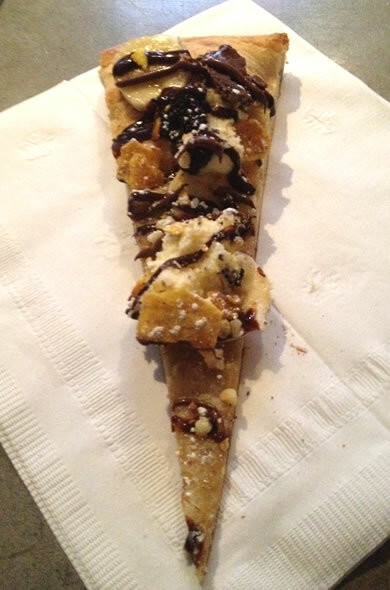 It had hazlenuts, banana puree, roasted plantains, chocolate covered bacon. I don’t know what happened after chocolate covered bacon. It was amazing. Ms. L and I both thought it was going to have too much banana but we loved it. I asked if Parlor Sports knew what the next rumble would be. They’ve done nachos, hot dogs, and something else. I suggested wings, or bar food, or cookies. 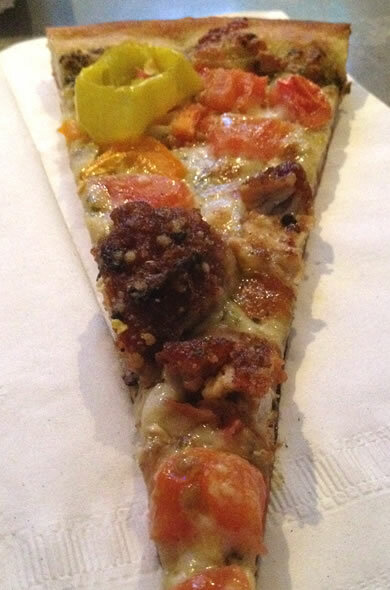 Pizza was a good one and now I have lots of pizza ideas to add to my collection…watch out! 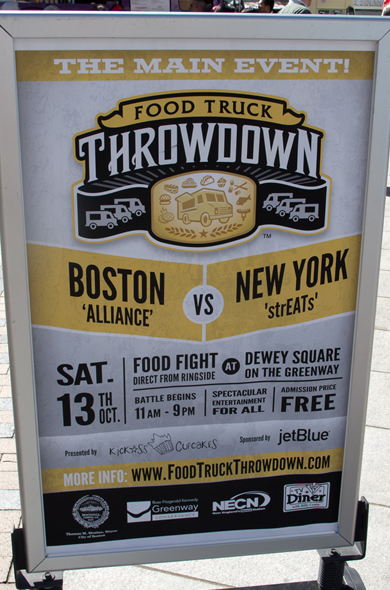 Way back when, I saw that Boston’s Rose Kennedy was having a food truck gathering. 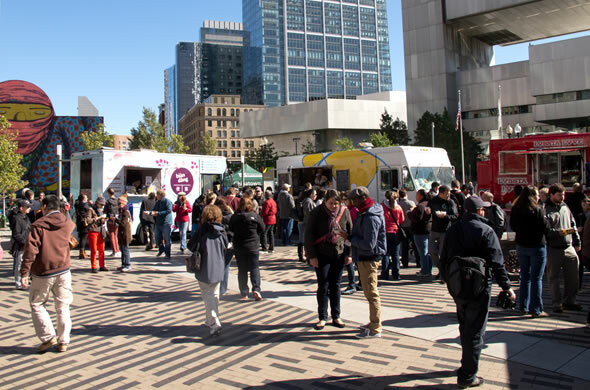 Unfortunately Occupy Boston meant that the food truck festival has to be postponed. Something like 150 protesters were camping out (I’d have a real stat if Occupy Boston’s own website actually worked). My beef with this was that they were not only vague with their mission, but they destroyed the park, lived in unsanitary and unsafe conditions, spent taxpayer dollars on police details, and refuse to recognize altering views. I feared when I attempted to obtain a permit for the park at work (by following the regulation, paying the fee, and leaving the park in perfect condition) that Occupy Boston would have ruined it for everyone. Thankfully I got my permit. Ok, I’m off my soap box. The food truck gathering was rescheduled and I just happened to be working in my office that Saturday. It was perfect timing and Ms. M met me for some lunch. 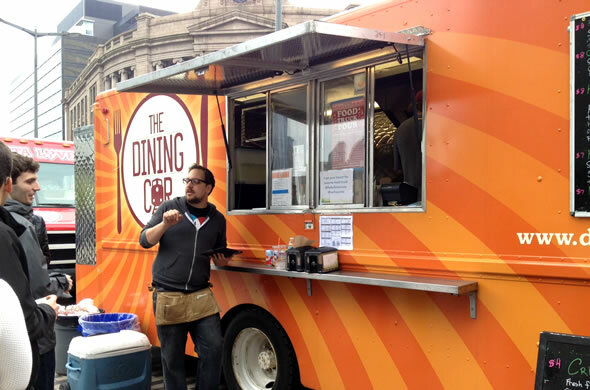 It was better than other food truck festivals I’ve been to. It was great to see so many out I hadn’t had before AND there wasn’t an entrance fee. We scoped ‘em all out and then chose randomly. I saw Staff Meal and was psyched to try it. 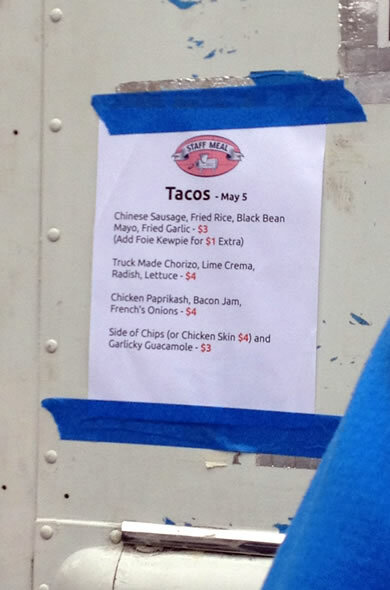 I was pretty drawn to the bacon jam and the truck made chorizo. These two items were dictating my choice. I couldn’t pass on the bacon jam. 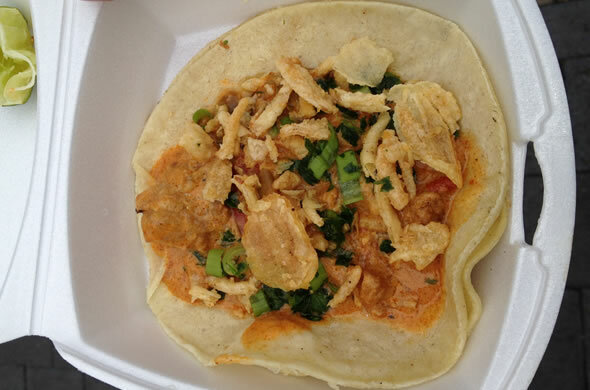 I got the chicken paprikash taco with bacon jam and French’s onions. It was the most interesting taco I’ve ever had. I loved the tender chicken with the paprika. The salty bacon jam was to-die-for. It had a lime to squeeze on top for freshness and crunchy onions. 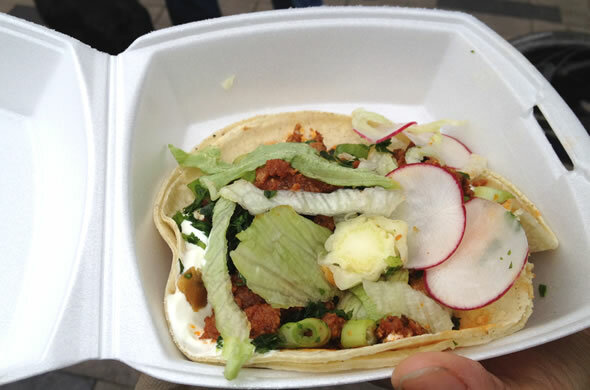 Ms. M got the truck made chorizo taco with lime crema, radish, and lettuce. It looked really good too. I just didn’t want to spend $10 on just 2 tacos. They were pretty special and significant but still a touch pricey. Then we were onto the sides. 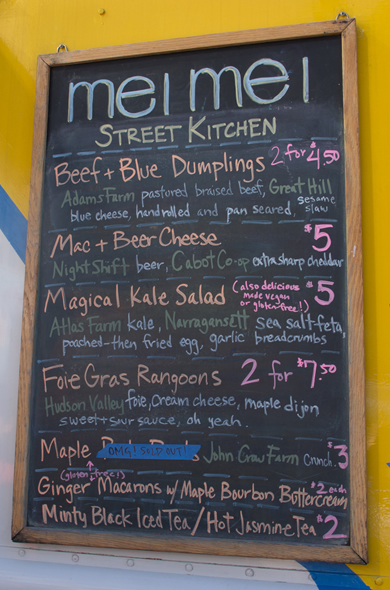 I saw the menu at Mei Mei Street Kitchen. They had some fun looking items and I hadn’t heard of their truck before. 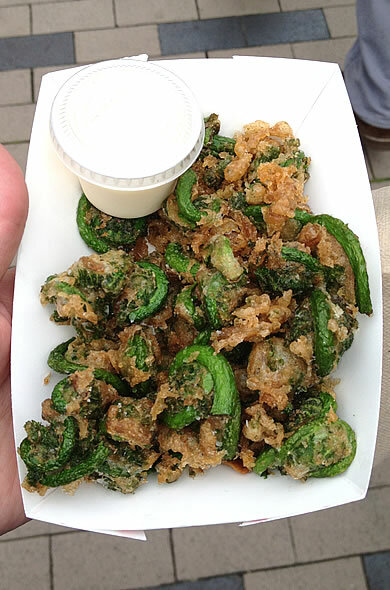 I got the fiddleheads. They were really lightly battered and fried. I looooved that they weren’t greasy and the freshness really came through. I wasn’t into the wasabi mayo though. 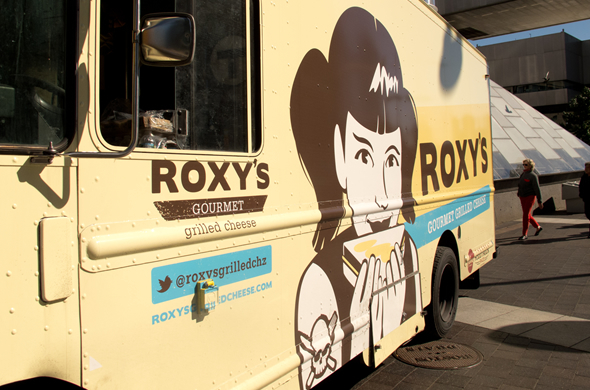 The Greenway is expanding their mobile eats in a big way…and I’ll be there! 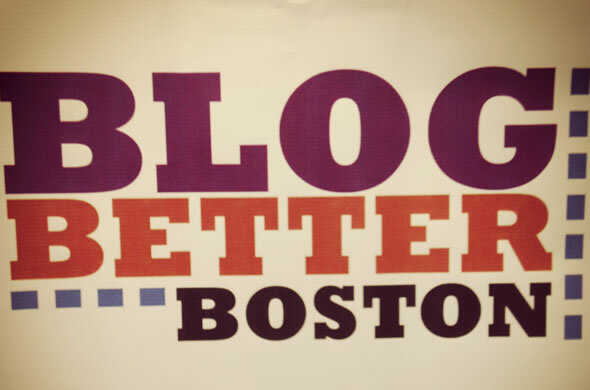 I recently attending a Boston blogger conference a few Saturdays ago at Google. 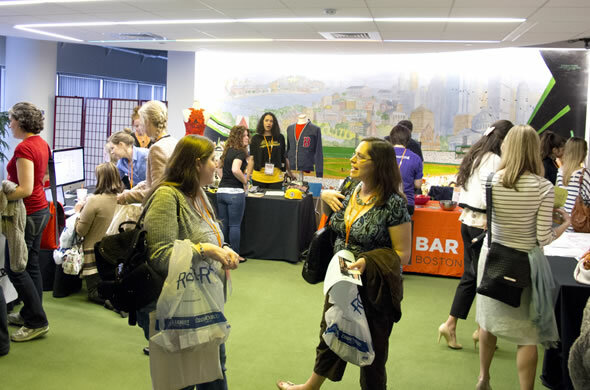 It was so great to see some bloggers I don’t get to see all the time and to meet some new ones at Blog Better Boston. I have to admit, I didn’t loooove everything. I think the conference was really well organized and attendees were really well taken care of (aka, free breakfast & lunch, goody bags, give aways etc). I loved that there were so many talented people in the same room! I think I just wasn’t all the way into shamelessly promoting my blog or meeting hundreds of new bloggers…feels like the first day of college to approach groups of people already in conversation. I was also tired from a busy couple of days at work so maybe I just wasn’t in the mood/mindset. I loved seeing some Boston Brunchers! Twitter was trending all day but I would have loved more digital examples from the speakers or highlights etc. It would have been cool to see what super skilled bloggers like, or look for, or are inspired by, how far their blogs have come, etc. 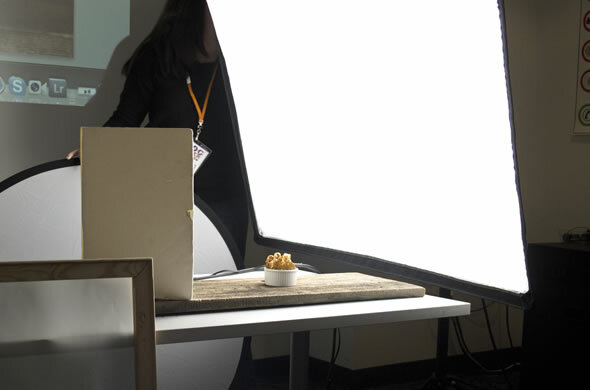 The food photo session had great examples of food photos with her own critique/notes. That was awesome coming from a professional. I can’t say every session was perfect for me. I think there were good ones to choose from and there was a variety. The speakers were great, but I think sometimes it was a bit too distant for the diverse crowd of food, fashion, and mommy-bloggers to relate. I mean, everyone can use info on building traffic/community and everyone benefits from discussions on monetizing your blog, but since it had to apply to pretty different writers it sometimes missed the mark because of concrete details or examples missing. 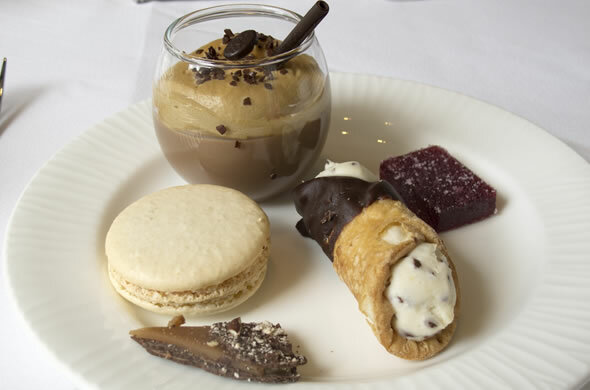 Working in events I truly believe you can’t please all people all the time though and I can be a tough critic. I loved the session on traffic & community and liked the food photography session a lot too. Even the list of attendees and their blogs was helpful to be introduced to some new local ones. You could spot the fashion bloggers right off the bat but I was really interested to see how many there are since that whole topic is wayyy outside my realm of knowledge. It was impressive that the space, breakfast and lunch were all donated…something I didn’t really need to know as a paying attendee, but the price wasn’t out of reach for most people. I also learned that it sold out. I think I got a lot of resources out of it and I know the work it takes to put on something like that. I know some new blogs to check out and have a short list of aps, books, websites, etc. I hope there are more in the future or even short programs that are more specific. I took an amazing class at BCAE before I started my blog and that 2 hour class was very targeted and honestly more helpful than this one was. It makes me think about my blogging identity. I don’t know where I’d fit between blogging pros & new blogs. I track my traffic but don’t market the three bite rule to expand readership. Hmm. Lots to think about.